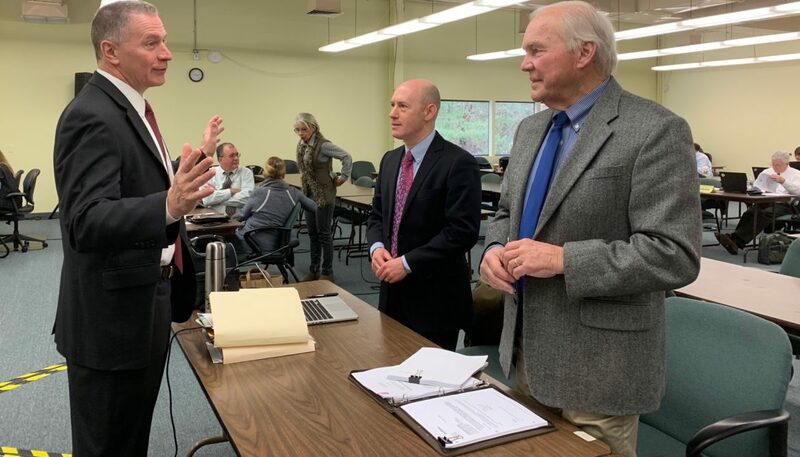 Eversource NH President William Quinlan, left, talks with Todd Selig, Durham Town Manager who represents intervenors Durham and UNH, and Durham Town Councilor Wayne Burton, in December during a break in day one of the Seacoast Reliability Project deliberations in Concord. CONCORD – The Site Evaluation Committee has released its final written order approving the Seacoast Reliability Project for Eversource to build an unpopular 13-mile transmission line from Madbury to Portsmouth. The committee had voted on Dec. 10 to grant Eversource a certificate to construct the $84 million power line, mentioning frequently during deliberations that it is a reliability project, one that is deemed necessary to provide the Seacoast’s growing demand for electricity. The SEC found that Eversource has adequate financial, technical, and managerial capability to build and run the project. As members did in December, the order stated that the project will not unduly interfere with the orderly development of the region, will not have an unreasonable adverse effect on aesthetics, historic sites, air and water quality, the natural environment, and public health and safety and lastly determined that the project is in the public’s interest. The final order, issued on Thursday, also listed a number of conditions that come with approval, including hours of operation and independent monitoring as noted by Durham Town Manager Todd Selig in an email response to questions on Friday. “Eversource has agreed to reimburse the town of Durham up to $50,000 to cover the town’s costs in hiring a qualified engineer to monitor the project as it progresses through Durham to ensure compliance with conditions and adherence to best management practices,” Selig said. Along with Newington and UNH, Durham opposed the project. Selig said at this point, the towns of Durham and Newington, as well as other intervenors, will have to review the actual permit language and decide whether a request for rehearing and ultimately an appeal to the New Hampshire Supreme Court is warranted. “While Durham/UNH and Newington opposed the project, expending close to $1 million collectively in scarce local resources as part of the SEC process, we also proactively negotiated memorandum of understandings with Eversource in the event it moves forward,” Selig said. The agreements lay out firm commitments to Durham, UNH, and Newington for the protection of natural and historical resources, the disposal of materials, hours of operation, and conflict resolution, Selig said. “If the project ultimately proceeds to construction, the residents of Durham and Newington should know that it will be a better project for our efforts — less impactful on individual property owners, numerous conditions to mitigate impacts to scenic and historic resources, and important permit conditions to protect the Great Bay Estuary in the area of the planned Little Bay crossing,” Selig said. The one-mile section that will be buried beneath Little Bay stirred controversy during the proceedings, but in the end the SEC allowed Eversource to employ the least expensive method of burying the cable called jet plowing. The order said that at least 90 days prior to the jet plow trial run, Eversource must submit a Jet Plow Trial Plan to the New Hampshire Department of Environmental Services. Environmental Services to be posted on the SEC’s website. “This order represents another step forward in our efforts to enhance the reliability of the electric system and support continued economic growth in the Seacoast region. We commend the SEC for its deliberate and thorough consideration of this critical project and its recognition of our extensive efforts to work closely with the host communities throughout the planning and siting process. “We look forward to continuing to work together in order to ensure a successful project that enhances reliability and supports economic growth, while also maintaining our deep commitment to our Seacoast communities, to environmental responsibility and to the protection of historic and natural resources like Little Bay that are critical to quality of life in the Granite State,” the statement said.